Aswathy and I went around the campus looking for different kinds of mud. To build a house we had to choose the mud that would make the strongest bricks. We came across an ant-hill. 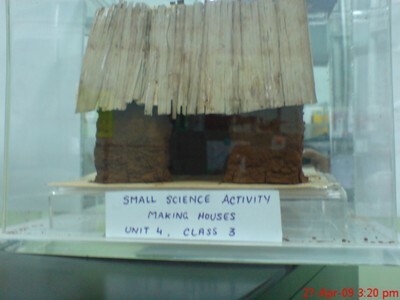 We had some previous knowledge from the teacher’s book that ant-hills can be used to make fairly strong bricks and with some regret (the poor ants seemed a little flustered!) demolished a part of ant-hill to collect some mud. We had to be careful here because red ants have quite a painful sting… The second mud sample was collected from a site that was away from the Ant hill. The third sample was taken from the base of a plant. From the tests it was clear that the mud from the Anthill was the strongest when compared to other two kinds. The mud from the base of the plant seemed the least suitable for construction. We believe this may be due to the presence of organic matter or sand. A hard cardboard was used as a base material to build the house. We molded a few bricks that were sufficient for the house. While the bricks were wet we stacked them together to make a wall. The bricks were stacked alternatively. We made 2 doors and a window. For supporting the bricks on windows, a plastic strip cut out from a box (found in the trash basket) was used as a beam. Later we reinforced our beam with a second plastic strip. When the walls were completed, we waited for the bricks to dry up completely. To avoid cracks, walls were watered at frequent intervals. We then plastered the wall by brushing some mud on it. After the walls were ready, we had to look for a suitable roof to fix on it. I found a waste card board sheet, folded it and stuck palm leaves on it. Oh! Our house looked so nice. When I reflect on the process, I realize that when we built the house, we did not make a plan. We laid the bricks as and when we made them. I wonder however, if children need to come up with a plan before building the house. We, as adults were able to spontaneously build the house without much prior planning. Hmmm…that was a quite an experience…I wondered how the ant-hill bricks are so strong? Probably the chemical substances present in the ants’ saliva or faeces. I remembered how houses during construction were regularly watered and now I know the reason behind it…so that they don’t develop cracks. Doing the tests helped us to understand the properties of different kinds of mud that aid in construction. You too can try making your own toy houses which will not only make the school/ home look nice but also at the end of the school year, you can put the bricks and houses back in the soil where they came from. Do write to us and tell us what your experiences were while making bricks and houses and the classroom management aspects as well; this being quite an exciting and messy activity! This is the first time I have seen an activity-based science book where the activities are worth doing and lead on to real learning and skill development.